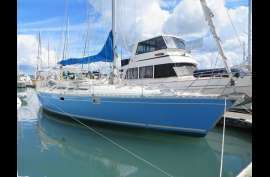 Features Yacht underwent significant refit in 2011/12 before sailing to New Zealand from Tahiti. The Sun Kiss 47 is a fast, comfortable blue water yacht with well protected cockpit but convenience of sugar scoop transom with steps into the cockpit. Full hull scrape back and epoxy barrier 2012, new rigging inc turnbuckles, recent dodger and bimini, starn arch for wind gen and davits. Repowered 2003 with 50HP Volvo on shaft. 500W solar, 2013 liferaft.